Arrival At Capital Of India . Go For Domestic Airport Take Fly For City Blue . Meet Your Tour Leader And Drive Straight To Hotel Warm Welcome At Hotel , Check Inn .Evening Meet Your Royal Enfield The Dreaming Bike. Take A Small Ride To Know The Bike Having Dinner With Local Family .Overnight In Hotel. 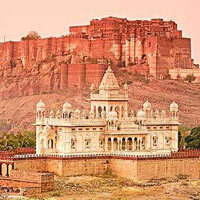 After Breakfast Start For Visiting Meharan Garh Fort And Jaswant Thada. Having A Small Walk In World Famous Clock Tower Market Of Jodhpur. 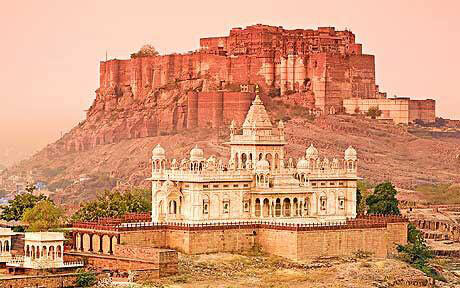 Afternoon Having Lunch In Open Restaurant In Jodhpur And Start Your Bikes To Go Ramdevra 200 Km Approx 5 Hours Ride . During The Way Having Some Tea And Snack On Highway Dhaba (Indian Restaurant ) Visiting Sunset From Pokhran Fort . Drive To The Ramdevra Town Check Inn Hotel. Having A Walk To Go For Dinner With Indian Family. Overnight In Hotel. After break fast start your royal ride for The Magical Town Jaisalmer. During the way visiting Kuldhara village and Loudhrva Jain Temple. Having a sort visit of village school to give some stuff to students (stuff provide by us) Arrival in town check in hotel . rest your motto for check up . having a lunch in hotel. After lunch we start our sight seen for this Golden city by walk. Then having tea and snack with 1 Indian family and back to the hotel . evening having a visit of market and go for dinner in restaurant . Time to go bad overnight in hotel . After Breakfast We Start For Visit Of Golden Fort And Back To The Hotel For Having A Small Lesson Of Indian Cooking And Tea Making . After Lunch We Start For Our Next Destination Phalodi. 170 K.M Approx 4 Hours Ride. Arrival And Check Inn Hotel . Go For Visit Khichan Village . This Village Is Famous For Havelies And Kurja Birds . See The Sun Set With Birds And Come Back To The Town. Having A Dinner With Indian Family And Back To The Hotel For Overnight. Time to say bye you Royal Enfield and mechanic . Having dinner at hotel and small party for closing this beauty full travel. Overnight in hotel. After break fast time to having some souvenir from this travel after noon transfer to the airport for Delhi. Tour finish with lot of sweet memories. Valid Driving Licence For Drive In India Etc.